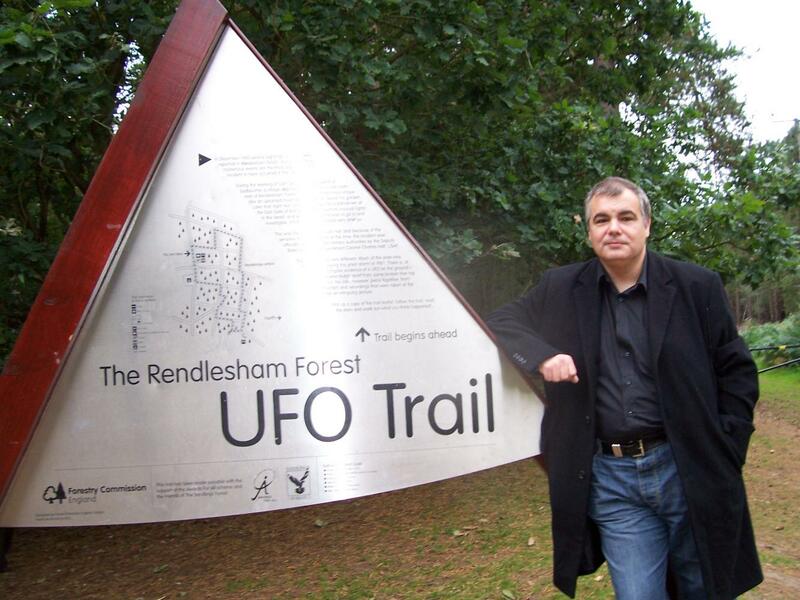 I had been invited to speak at the recent Rendlesham Incident UFO conference at Woodbridge Hall, Suffolk, England in September 2011. Having attended the previous 30th anniversary with the main joint presentation focused around James Penniston and John Burroughs, two key security police witnesses who were involved in parts of the major sequence of events in 1980. Having joined the party at the now famous East Gate checkpoint at the now de-militarised base at night time after the conference to listen to their further accounts after the conference, I realised that it was time to visit the area during daylight. My mother accompanied me on the journey early enough to view the Rendlesham forest area before going onto the Woodbridge conference to listen and then speak later in the evening. We arrived at the Rendlesham Forest visitor centre in the mid-afternoon and set out on the UFO marked trail path route. We proceeded along the marked pathway that lead along the logging and cleared path ways towards the East Gate. This was my first time to see the UFO sighting areas during daylight. It was an overcast day but with good illumination from a slowly clearing sky to the south, which brightened the area up with breaks the cloud and the slightest drizzle intermittent on few occasions. We explored the path that leads to the marked area where the first nights UFO occurred, documented by James Penniston and the accompanying John Burroughs on this first encounter sequence of events. I was aware that the forest now bore little resemblance to the original tree lines, since countless tree felling and the 1987 hurricane had all significantly changed the landscape and surroundings. However, the pine forest still retains much of its density, with new areas growing to the original tree heights in some areas. After some camera shots were taken of the East Gate and then the landing site, we had progressed to the small clearing which opened out into the large field, which offered a wide view of the other widely known field, part of the second nights incidents and focus of Larry Warrens main incident point as described in his account, ‘Left at East Gate’ (co-written with Peter Robbins, revised edition in print). 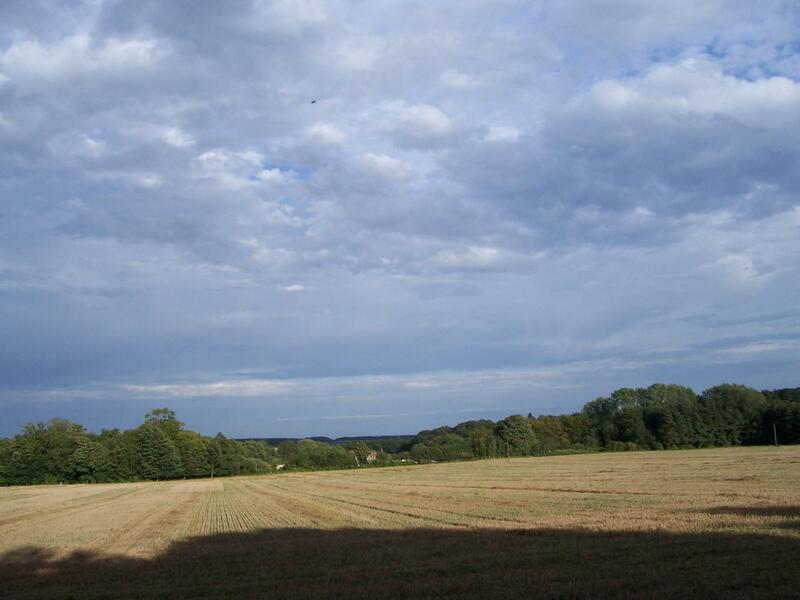 On looking directly towards the lone farmhouse, central as a marking in the field in the mid-distance, we noted no birds or typically identifiable flying craft of any description. My mother noted the quiet stillness with no whirr of micro-lites, helicopter or any type of aircraft noise. We were interested to observe the soon to be decommissioned Orford Ness lighthouse but it was slightly misty in respect of longer distance vision towards the horizon line. After 2 minutes of observance and looking across the opening, we noticed a small blip in the distance to the airfield direction of the field at a left bearing. By pure good fortune, it happened to be just when my mother happened to be taking some pictures with camera already poised across the wide rural field panorama. I had recommend her to focus on this area and one shot was taken and I asked her to pause as the object disappeared a few seconds after the picture was taken of the UFO. We waited to see if this object would make reappearance in any way, perhaps making some manoeuvres which might reveal more conventional angles of a typical object we get to investigate and are so often able to identify. After five minutes, some additional pictures were taken whilst scanning the skies left to right across the field expanse. No other objects were seen, with no birds in flight or other aerial objects. The rest of the UFO trail was completed and was mostly a tracking back to the forest visitor centre. We had to wait until the following day to get a closer look at the object captured on this afternoon’s encounter, as my mother’s camera did not have a substantial LED review window pane on this particular camera design she owned. On attendance and speaking at the conference at Woodbridge, I decided to refrain from mentioning this at the time, as I was certain we had both seen something which would later be explained as a typical object. The following day, the camera card was downloaded and we were both surprised to see that the object retained a high degree of strangeness, even after many phases of magnification. The object can be seen to be of a rounded disc shape with some light distortions on the outer edges. This can be seen clearly before the pixels go to the extreme. There are hints of feint lines on the upper top centre of this daylight disc but they are so slight as to not give any further clues. With the scope for all sorts of new drone technology and perhaps even advanced light reactive fuselages, this could offer a possible explanation for the object. “The chameleon active camouflage has certainly been in development (and perhaps use) for many years now. I remember seeing a demonstration of it working on tanks on 'tomorrow’s world' or similar many years ago. Miniature cameras detect whatever is 'behind' the object then 'project' this image onto the 'front' face (easy with 'flat screen TV technology'), making the object literally 'disappear' from view at will. We all agree to remain open on this but it is difficult to attribute this to an insect and we checked the camera functions. The lens was free of dust and anything that could cause a distortion. The second shot taken about 2 minutes afterwards towards the right of the field did not reproduce any repeat of any possible lens problem. We also checked the whole sequence of shots leading up to and after the sighting and no image featured in any of the complete sequence that would indicate a consistent camera fault or repeat image related to the photography. I would have been quite content to spend a whole lifetime without having the opportunity to capture an object considered as a candidate for the UFO category. To have a photograph taken anywhere of a UFO is an uncommon event but for this to be right in the line of sight of the second nights activity at the Rendlesham UFO case of 1980 was highly unexpected. For case to occur three hours before a UFO conference anywhere was surprising, more so exactly over the location of one of the areas involved in what has become the most famous U.K. case. Your further thoughts on an explanation for this object are welcome and I count myself one of the lucky few to have personally photographed an anomalous object, having been in just the right place and right time. Thanks to Mark Easen and Heather Dixon for their views and thoughts on this photograph, especially for looking into possible causes such as micro-light flights, kites and other possible causes. 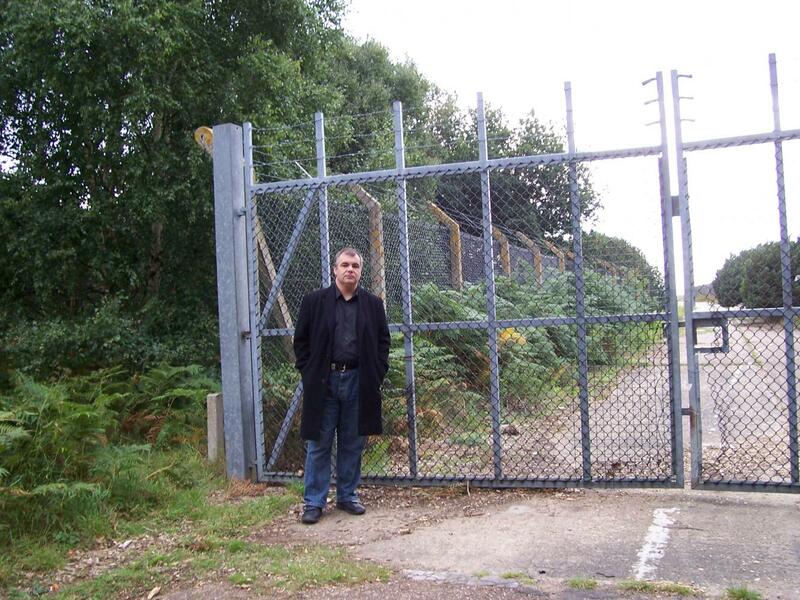 For now, this will remain as a sighting at the location of the Rendlesham Forest UFO incident, 30 years after the original events unfolded. The forest is known for many strange events preceding the 1980’s and right through the decades until most recent times, including reports of aircraft instrumentation problems, radar images that defy normal plane movements and host of other anomalous reports. As far the famous incident is concerned, we have just learned of a new witness who was a taxi driver. He had been transporting personnel from private dwelling to Bentwaters air base and both car occupants witnessed a large object, just a few hours before the second nights incidents had begun to unfold in the early hours the following morning. If fixed cameras were employed around the area in the same way they have been used in project Hessdalen in Norway, what may further be captured of interest in a forest and area well known for its disproportionate high strangeness events? For now this new sighting photograph remains in the UFO category.